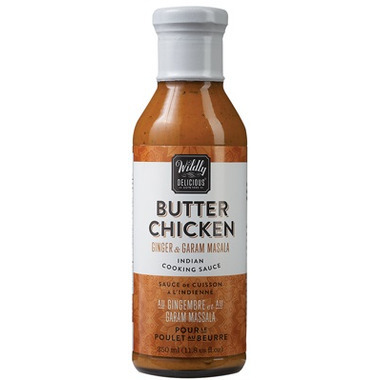 Wildly Delicious Butter Chicken Cooking Sauce allows you to re-create this rich, velvety, Indian restaurant favourite at home or try a modern spin on the dish by making Butter Chicken Pizza. Spread any leftover Wildly Delicious Butter Chicken on naan, sprinkle your favourite cheese on top and pop it in the oven until cheese is melted. For an added flavour adventure, sprinkle fresh cilantro on top. Enjoy! Ingredients: Water, cream, tomato paste, onion, butter, brown sugar, garlic, ginger, sea salt, habanero pepper, carrageenan, locust bean gum, pectin, citric acid, spices. Contains: Milk. May contain sulphites, tree nuts, sesame, eggs, wheat, soy, fish, mustard. Very good for those craving Butter Chicken without all the work. Love this sauce so much I bought six jars. It's really hard to find in stores so I'm glad I checked here. It's great for easy dinner night. Lots of flavour with a nice touch of heat. I bought this after reading the reviews and I was incredibly disappointed. We ended up just throwing it out. It is terrible, I would not recommend. The best is mixing one jar of the Kitchens Of India Spicy Butter Chicken Cooking Sauce and one package of the Kitchens Of India Butter Chicken Curry Paste together! I love this sauce for easy weeknight dinners. I use whatever veggies are on hand to make a delicious meal that even my toddler loves! I've had butter chicken from Toronto to India. This is 'the one'. Great for fooling guests into thinking you are an award winning butter chicken artist. Yum!!! For a quick dinner!